The latest news of what has been happening at the club. Once again the club's annual Classic Car Rally was a great success. With over 70 cars meeting at the Star Inn, Roberttown, for display and for their drivers and passengers to have breakfast, and with cars ranging from a 1935 Triumph Gloria Southern Cross (pictured) to a fabulous modern Morgan Aero it was a spectacular sight. The cars then set off on a drive into the beautiful countryside of North Yorkshire ending at Lightwater Valley where we were kindly provided with a private carpark to display the cars once again. This proved popular with other visitors to the park who were fascinated to see a large gathering of very special cars. The cars had been judged, taking in factors such as their age, condition, quality of restoration and also just how they caught the eye. 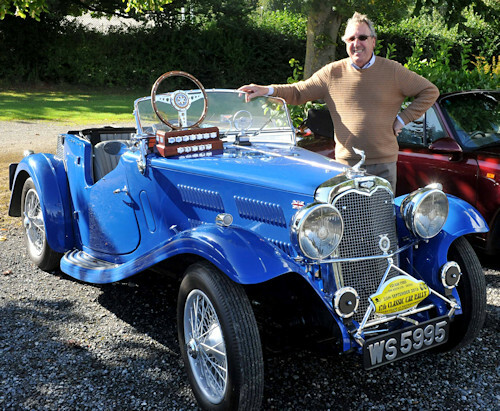 A prize-giving took place with the winning car being the beautifully restored 1935 Triumph Gloria Southern Cross pictured above with the proud owner and his trophy. Another award, the Colman Trophy by Colman Tyres of Liversdege, is given to the car that the judges thought to be the most unusual or special in some way. 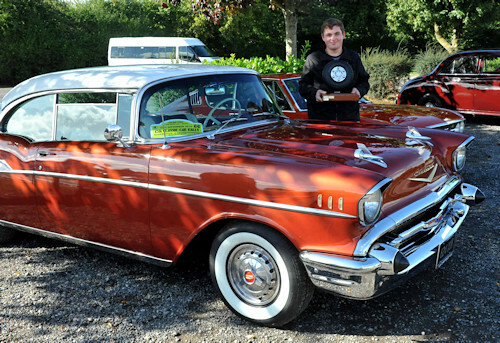 This was won by a lovely 1957 Chevrolet Belair which attracted a lot of attention. The longest serving member of the club achieved 50 years in Rotary today. David Armitage, a retired optician, joined the club on this day in 1966 and continues to attend the meetings regularly and supports the many fund-raising events. David has been president of the club on two occasions, in 1975-76 and then again in 2010-11. To commemorate this golden anniversary, David was presented with a gold number 50 to attach to his past-president badge. He says that the main benefit of being a member of the club has been meeting new friends. "I’ve got to know an awful lot of people I wouldn’t have met otherwise." 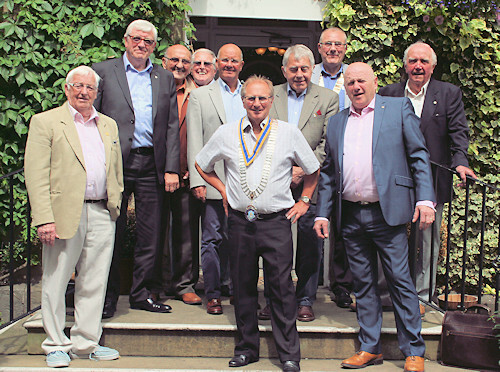 he said, "It’s a totally diverse group of people that meet for lunch each week and I have enjoyed my time in the club". The club had a tombola stall at this year's Hecky Fest in Heckmondwike town centre to raise money for charity. Hecky Fest is a two day music festival held annually in Green Park with bands performing on two stages. 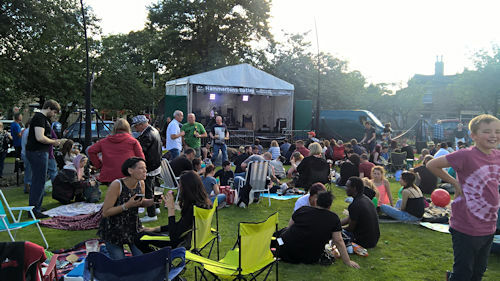 This popular event attracts thousands of visitors to the park where there are also fairground rides, food and drink stalls, trampolines and more. 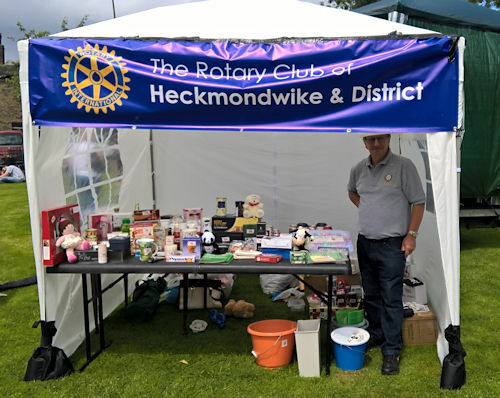 Heckmondwike & District Rotary Club were joint sponsors of the event and the tombola stall was so successful that all the tickets and prizes had gone at the end of the first day! All money raised will be donated to charity. Mike Lister, the new president of the Rotary Club of Heckmondwike & District is the eighth member of his family to hold that position. Since his grandfather, Dempster Lister – a well-known baker in Heckmondwike, founded the club in 1931 his great grandfather, father and 4 uncles have also held the post. 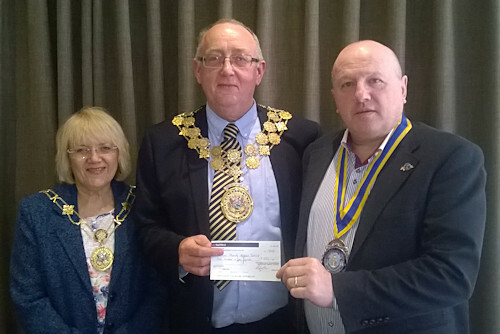 Because his family have been so involved in the club, Mike, who owns a software company in Liversedge, feels that Rotary is in his blood. Although he has only been a member since 2010 he felt at home straight away. Attending Rotary functions and fund-raising events with his relatives from childhood has given Mike a deep insight into how Rotary works and the good work it does. A sunny day, good company and eight different wines to taste - what could be better? The club held a wine tasting event in association with Leeds Wine & Champagne Inc with the opportunity to sample eight different French wines.Each wine was introduced by Georg Vitzthum with a description of where it was grown and how it was produced which was very interesting to hear. Food was provided by Orlando of Orlando's Italian Restaurant, Grange Moor, with a selection of Prosciutto, Salami, Olives, Pickles, Bread and much more. 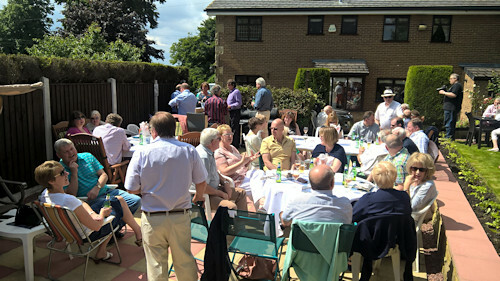 The event was a great success and thanks go to Edwin Crowther for organising and hosting the event and his family for the help they provided. We had the pleasure of welcoming Paul Kane, the Mayor of Kirklees, to the club when he visited to tell us about the Mayor's Charity which is supporting the work of Diabetes UK. He told us that diabetes is a serious, lifelong condition, however if treated properly people with the condition can live long healthy lives. 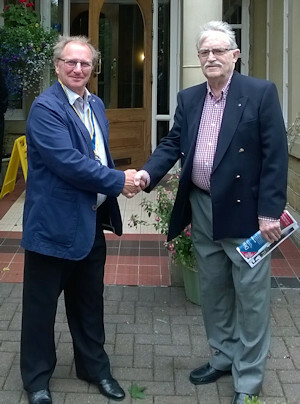 After the Mayor's talk President Orlando presented him with a cheque for £250 to support his charity. 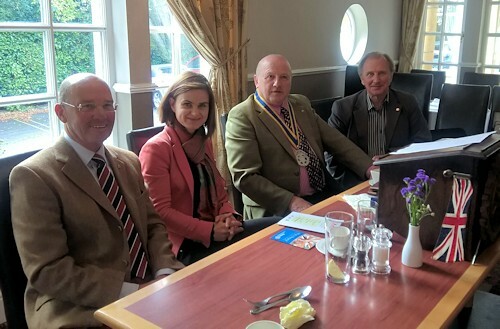 Jo Cox, the member of Parliament for the Batley and Spen constituency attended the club's regular weekly meeting today at Healds Hall Hotel. Jo was welcomed by President Orlando (with chain), Mike Lister (on right) and Chris Wooller (on left). After lunch, Jo gave a short speech, telling the members about her experience of entering the Houses of Parliament for the first time. She followed by saying that she hoped the club could work with her on local community projects in the area. 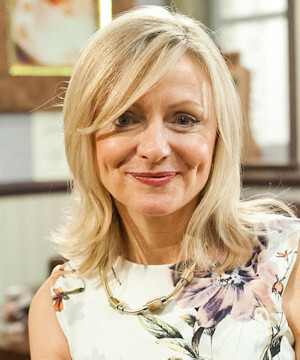 Chris thanked her and said the club would keep her informed of any project that the club was delivering locally. President Orlando chose TACT as his charity to support in his first year in office. A cheque for £1,500 was presented to Lisa and Carol from the charity who thanked Orlando for the generous donation. TACT (The Adolescent and Children's Trust) provide help and support for young people who are adopted or fostered. More information about TACT can be found on their website. 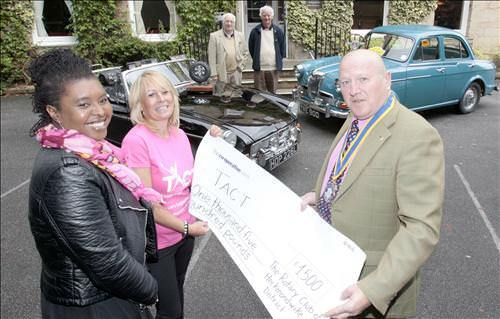 The club's main fund-raising event is its annual Classic Car Rally, with the last one raising over £3,000. Two classic cars were present at the presentation along with their proud owners Barry, 1963 MG B Roadster, and Derek, 1961 Riley 1.5. This year's rally is due to take place on Sunday 27th September starting at the Star Inn, Roberttown. Download the entry form if you would like to take part. Read the article about this that appeared in the Yorkshire Evening Post. A great night was had at the Lakeside Restaurant, Heckmondwike where almost 100 Rotarians and their guests enjoyed dinner and dancing to AJ & Sam. 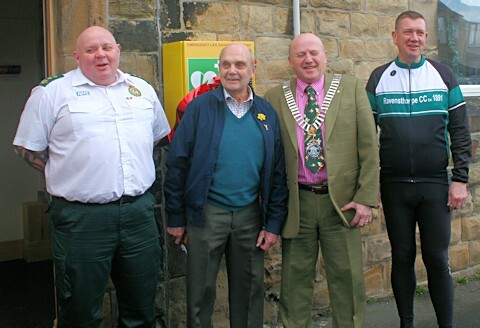 The Roberttown Roadrunners and the Community Centre were raising funds to have an automatic defibrillator fitted to the outside of the Community Centre and asked Heckmondwike Rotary Club if they could help. Almost half the money had been raised and our club immediately offered to provide the rest and also provide enough to fund the installation. The unveiling was attended by members of Heckmondwike Rotary Club, the Community Centre, Roberttown Roadrunners and the local community with tea and cakes being served in the hall. 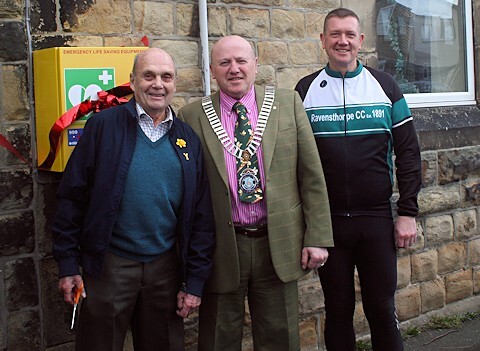 The official cutting of the ribbon was done by Brian Robinson (first Briton to ride in the Tour de France ) along with Dave Jones (Yorkshire Ambulance Service Community Defibrillation Officer), Orlando Gubbini (President, Rotary Club of Heckmondwike and District) and Richard Bamforth (Roberttown Roadrunners and Ravensthorpe Cycling Club). If a 999 call is made because someone is having a heart attack, the operator will know if there is one of these defibrillators close by. They can give the caller the code to open the case and someone can retrieve it while the patient receives first aid. The defibrillator speaks to the person using it and instructs them in how to use it. It can tell if the pads have been put in the correct place and also if the heart's condition requires shocking and will only do so if all is correct. 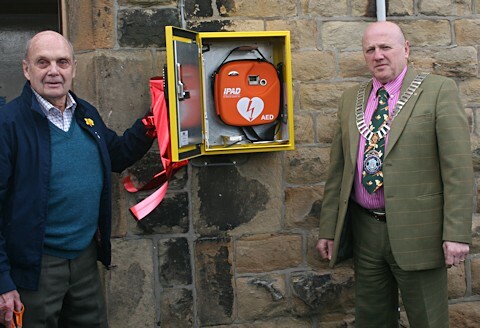 The members of the Rotary Club of Heckmondwike and District are pleased to have been able to help with this very worthwhile local project to save lives. It was nice to see so many guests at the club's Thursday meeting where members were accompanied by their wives and partners and the club invited the widows of deceased members for a Christmas lunch. With so many people meeting old friends and a meal of turkey and Christmas pud, with crackers and paper hats, it was a lovely lunchtime. A Christmas message was delivered by Father Nicholas Hird from St. Paul's church in Cleckheaton which was a reminder of the true meaning of Christmas told through a lovely story about Santa Claus. A great time was had by all who attended the club's Christmas Dinner at The Keys restaurant in Huddersfield.The Keys is located in the crypt under St. Peter's church in the centre of Huddersfield and provided a great atmosphere with its vaulted stone ceiling and cosy lighting. The club took over the whole place and were treated to a superb meal which was enjoyed by all. 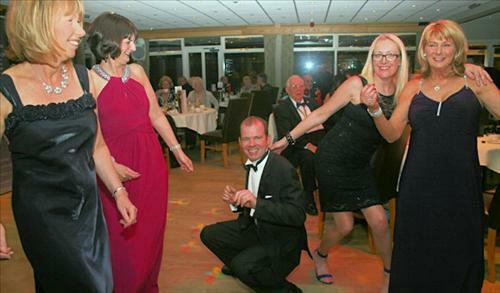 Entertainment was provided by Steve Long who sung some classic songs from stars such as Frank Sinatra and Dean Martin after which the tempo was turned up a notch and the dancing started. A terrific night and a perfect start to Christmas. Thanks Orlando and Debbie for organising the event. The Rotary club had a stall at the Ponderosa Christmas Market today with a bottle stall, mulled wine and a display to promote Rotary's activities both here and abroad. With over a thousand people coming into the market it was a busy day for our vounteers and the bottle stall proved to be extremely popular and at £1 a go there was the chance to win a bottle of wine, beer, pop, water or an empty bottle! It was a bitterly cold day so the hot mulled wine helped to warm up the market goers and keep their spirits up. Thanks to all those who donated bottles and to those who helped with the stall. The Christmas Lights switch-on in Heckmondwike once again attracted thousands of people into the town centre where the Market Place and Green Park are taken over by a Fun Fair with rides, roundabouts and stalls selling everything from burgers and hot dogs to glow-sticks and swords. The Rotary club again provided the main atrraction for smaller children - Santa's Grotto and we also had a bottle stall nearby. Santa arrived in Green Park on his sleigh at 1.45pm and found a queue of small children had already formed to welcome him. The queue never shortened and got even longer as the time for the Christmas Lights to be turned on got nearer. At 6.30 the lights were switched on and still the children kept coming until at 7.30 all the presents had gone and the grotto had to be closed. With over 260 children having passed through, it left Santa and his elf helpers exhausted. The Bottle Stall was equally as popular with the grown-ups and the stall full of bottles completely sold out. Over £500 was raised and thanks are due to all those who helped. More infomation and photos here. It was a close run thing, but we did it! The local Inner Wheel Club had 11 spare boxes for the Rotary Shoebox Appeal. We got them to fill on Saturday night. They had to be filled and ready for dispatch on Monday. And we did it. The Rotary shoeboxes are filled with items in different categories. Some have things for children, either a girl or a boy, and some have household items in them. They are collected, sent to countries abroad and distributed to needy people there. If you want to see what a difference these make take a look at this YouTube video. Although it is not a Rotary shoebox, just look at the reaction. The 11 shoeboxes we recieved were filled in 24 hours, thanks in part by a generous donation by Rtn. Howard Cook which enabled more items to be purchased.